You could say Gus Gutierrez is the quintessential mover and shaker. With homes in New York, Switzerland, London and Miami, his interests are as diverse as his travels. Yet lately, the property developer and former designer has set his sights on revitalizing downtown Fort Pierce — a place he recently chose to call home. A bold undertaking indeed but one that has taken him on a journey he clearly relishes. 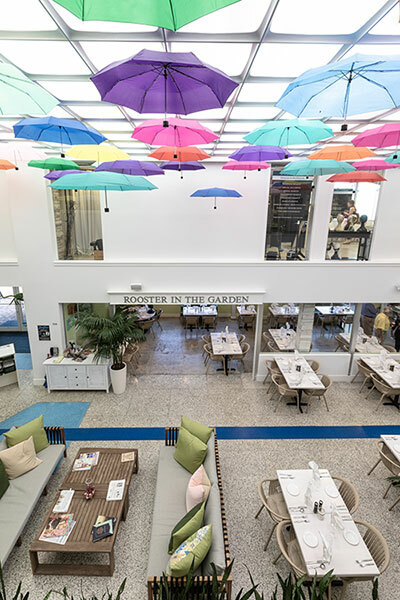 Purchasing an abandoned historic building, he transformed what used to house a bank into the Galleria of Pierce Harbor, a shopping complex anchored by two interconnected dining concepts and several upscale boutique stores. Ideally situated in the heart of downtown, the location couldn’t have been better. With the popular Sunrise Theatre directly across the street, county buildings close by and 2,000 workers seeking sustenance, Gutierrez tapped into a thriving market. 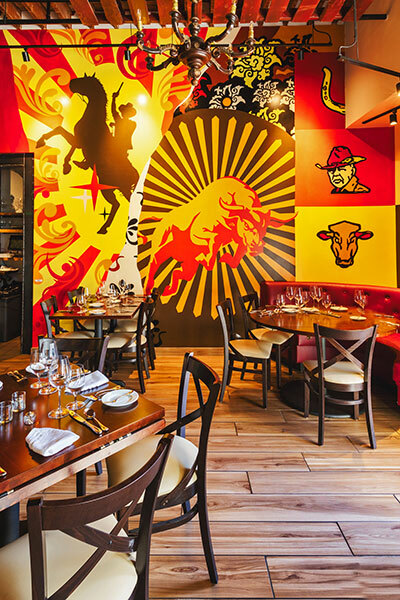 One of those dining concepts is the Braford Steakhouse, a 100-seat chophouse that opened its doors in June 2018, a steer’s head positioned prominently over its Second Street entrance. Two seating areas offer either indoor dining or an outdoor courtyard for those seeking a more intimate and relaxing dining experience. The décor at first glance seems to echo that of clubby steakhouses across the nation — dimmed lighting, dark polished woods, plush leather banquettes, a central bar and an open-concept kitchen. On closer inspection, the ‘no white tablecloth’ approach along with cowboy-themed pop art murals and wine bottle chandeliers speaks to a younger audience, striking a pose somewhere between tradition and modernity. On any given night, you might find Stetson-toting cowboys dining next to out-of-towners all looking for a good meal and a good time. The opening of the Rooster in the Garden preceded the Braford’s debut, offering lunch and dinner six days a week and brunch on Sundays. By way of contrast, the décor here is casual — light, bright and cheerful spanning three dining rooms, both indoors and out with a flavorful and finely tuned seasonal menu of southern-fusion farm-to-table fare. 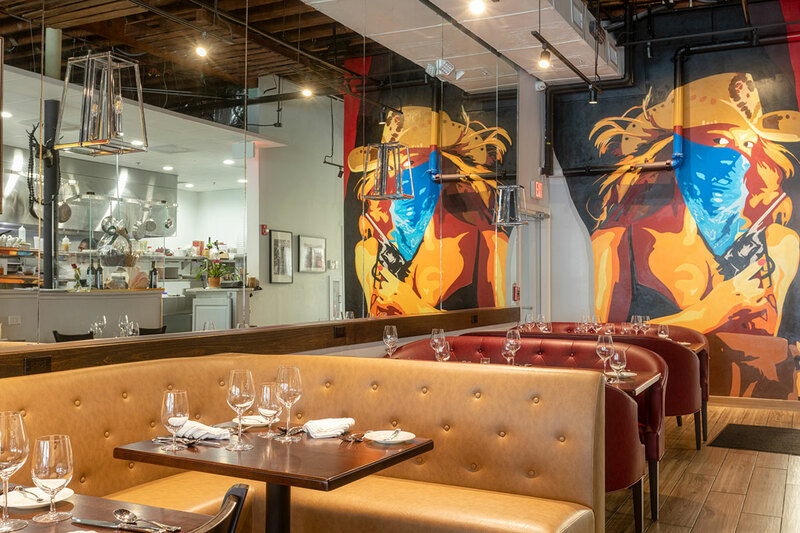 Traditional plush leather seating and an open-concept kitchen is counterbalanced by the more modernistic pop art murals that define the eclectic interior decor. Both eateries serve the local Adams Ranch Natural Beef®, a product of the pasture raised, hormone and antibiotic-free Braford cattle that Adams Ranch has been producing since 2016. Carrying the Florida Department of Agriculture’s “Fresh from Florida’ label, their meat is widely recognized for its superior taste and tenderness. “We wanted to partner with those of historic significance who had made positive influences in the area,” Gutierrez says of his decision to bring the Adams Ranch on board. It was a mutually beneficial pairing from the start, points out Mike Adams, one of three brothers now running the ranch after the death of his father, Bud Adams, iconic rancher, environmentalist and photographer. One significant member of that team is executive chef Gregg DeAquair, a Florida native who brings a wealth of experience to the table. Having worked his way up through local strongholds like the Ocean Grill, The Moorings Club and the Indian River Club in Vero Beach, DeAquair says he learned from the ground up. 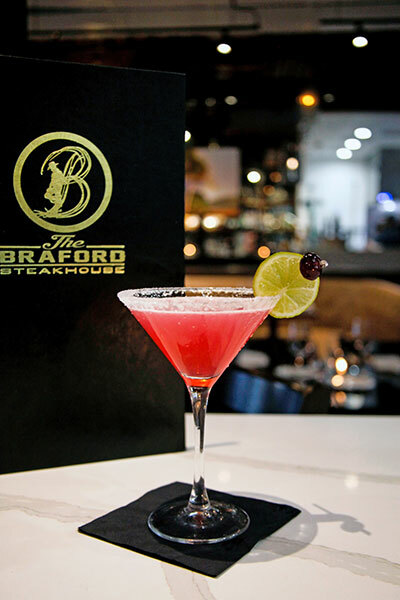 The Braford’s menu, described as “fine dining from ranch to table,” is carefully and collaboratively curated by DeAquair, Gutierrez and the Adams brothers, featuring all the classics you might expect from an upscale steakhouse. There’s the ever-popular filet mignon, New York strip loin and 20-ounce Chateaubriand — a portion large enough for two and then some. 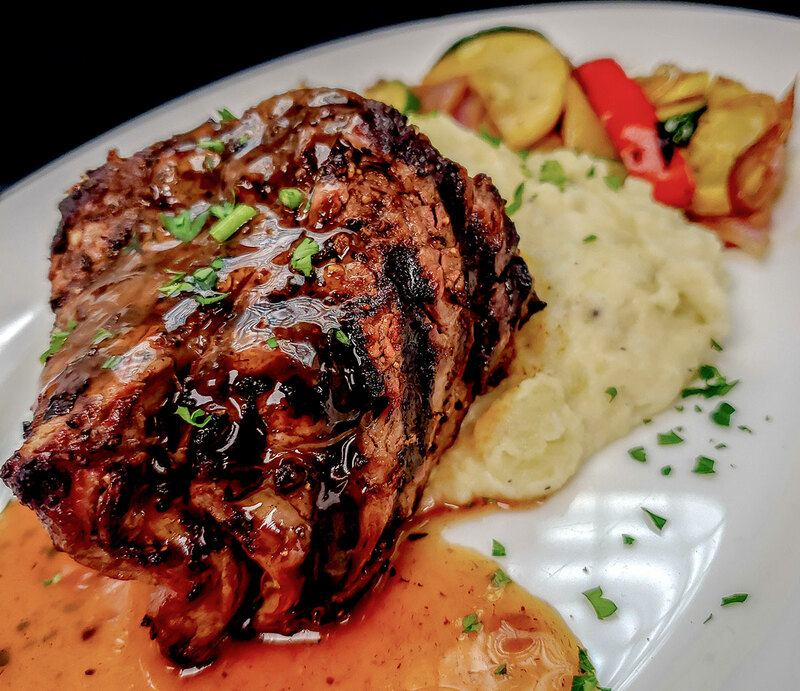 Then they offer the ribeye, T-bone and porterhouse steaks that are dry-aged for up to 21 days, a process that encourages the natural enzymes in the meat to break down muscle tissue for improved texture, flavor and mouthfeel. Rounding out the entrees is a New Zealand rack of lamb, a double Berkshire pork chop with bourbon-maple pear compote, a herb-crusted chicken and the local fresh catch of the day, plus all the evening’s specials. Meals come with a choice of soup or salad made with organic and locally sourced ingredients whenever possible. “We buy from Osceola Organics, Hogan Farms and local farmers,” DeAquair says, adding that he has a passion for sourcing locally grown produce that elevates his food. 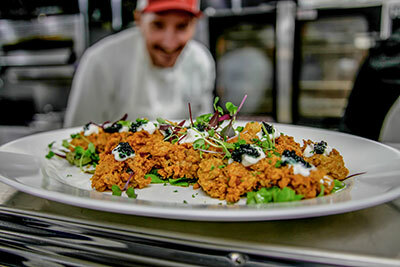 On both menus, the chef successfully delivers a variety of dishes to satisfy the carnivore and every palate in between. For a rich and comforting starter, try the roasted bone marrow with rosemary lemon bruschetta, a bovine-rendered must-have. An appetizer of locally farmed quail is an elevated essay on your mama’s cooking. DeAquair charbroils the quail, drizzles it with peach compote and adds collard greens, skillet cornbread and sweet Vidalia onions to the plate. It’s a successful ode to an iconic Southern staple. Another surefire winner is the pan-seared scallops: two plump diver sea scallops, perfectly seared and served with Meyer lemon aioli. Not only is the dish beautifully presented but also flawlessly executed, allowing the sweet, buttery and delicate flavor of the scallops to shine through. For those seeking more veggie-centric options, the sides include the usual steakhouse staples, such as creamed spinach, baked or mashed potatoes and grilled vegetables. Patrons can then venture into the world of lobster mac and cheese, fried skillet corn kernels and a medley of roasted Brussels sprouts, carrots and fennel. The sweet potato planks get special kudos from diners with children. Just mention a special occasion and you might see a slice of housemade Key lime pie delivered to your table. The cocktails, creative and skillfully crafted, are noteworthy. Many of the best mixologists can be found in restaurants, and here is no exception. One could happily spend an evening cozied up to the bar, sipping a strawberry bourbon smash — fresh strawberries, lemon juice, mint, premium bourbon topped with a ginger beer. Or the popular signature drink, “The Braford,” an old-fashioned classic with craft smoked chili bitters. Judging by the online accolades, customers are delighted to discover a superior-quality steakhouse outside of the standard-bearers like New York, Chicago and Texas. Rave reviews touting the quality and consistency are surely a tip of the toque every chef wants to receive. “All the reviews have been amazing, and we are happy with the response from the community,” says Gutierrez. 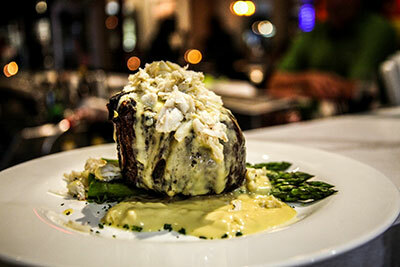 “People are driving from Martin and Palm Beach counties to eat steak. It’s definitely worth the drive.” He says the venue is really one restaurant with two dining concepts to satisfy every craving, and a gourmet market is now in the works where customers can purchase the restaurant’s signature meats, rubs, sauces and wines. 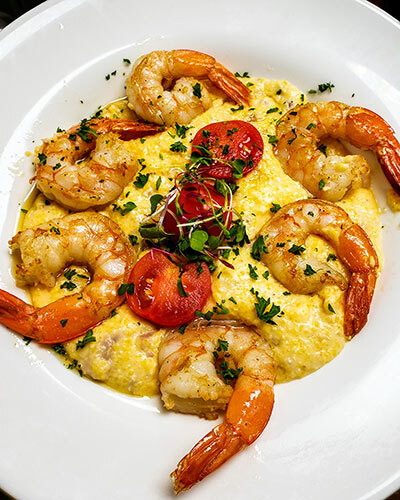 A bowl of cheesy Georgia Stone Mountain grits with wild-caught Gulf Coast shrimp is served at The Braford’s sister restaurant, Rooster in the Garden. Hours: Tuesday — Saturday 5-9:30 p.m.; Sunday 3-9 p.m. Reservations recommended.